After a great day in Edinburgh it was time to see more of Glasgow since I had only spent an evening there. 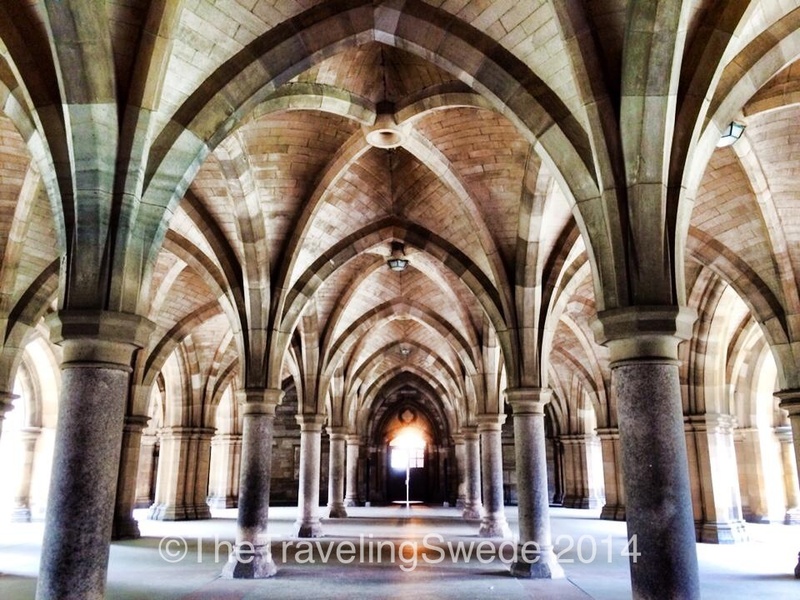 First up was a visit to the University of Glasgow and as expected it was magnificent. Just walking around on campus was like being on another planet. Peaceful and inspiring. 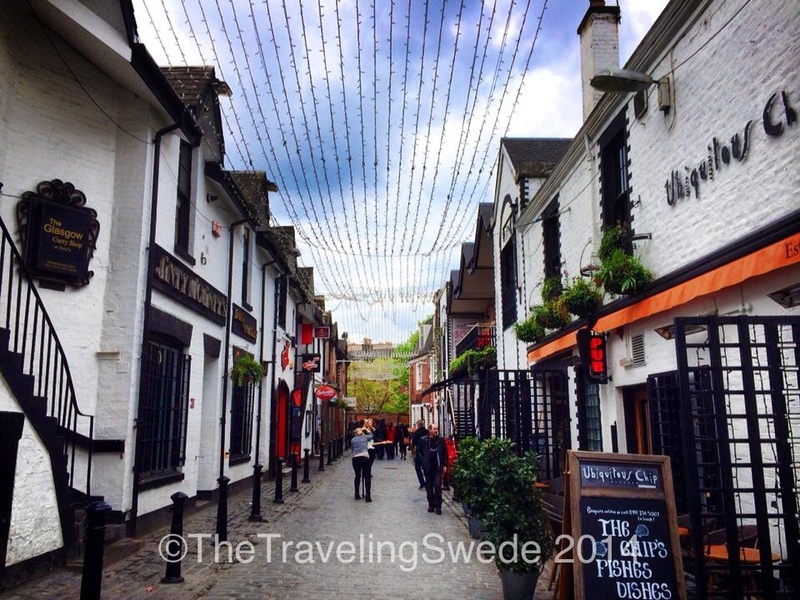 This has to be the cutest street in Glasgow! It’s right next to the University and has cute shops and restaurants. 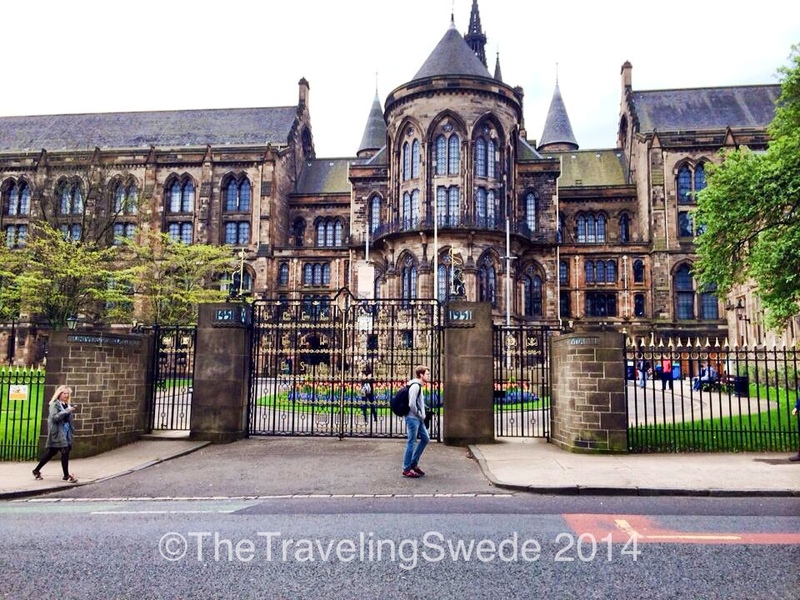 The main gate entering University of Glasgow. I just wanted to be in a horse and buggy ride and go through that gate arriving at one of many events I’m sure has taken place here. Where is that time capsule when I need it? How old is your school? 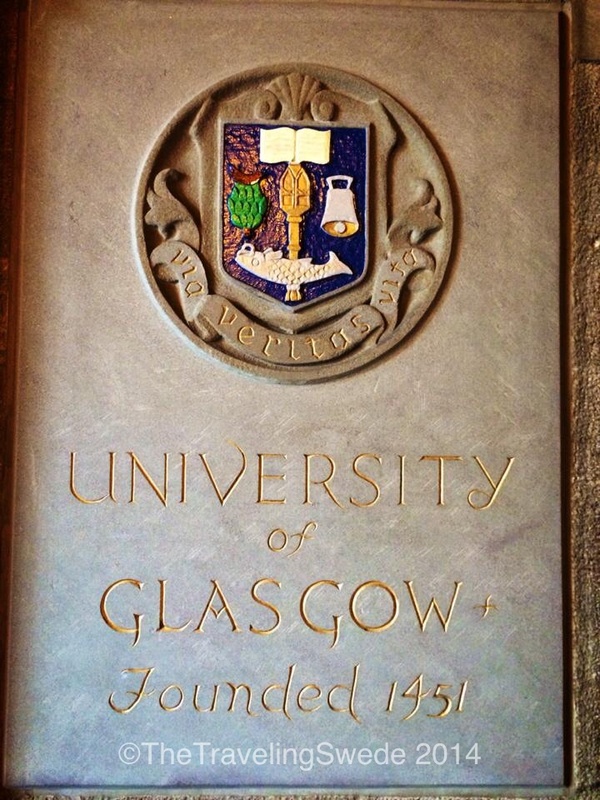 University of Glasgow was founded 1451. As soon as you walk around the university you feel this peaceful feeling combined with knowing the history that surrounds you. 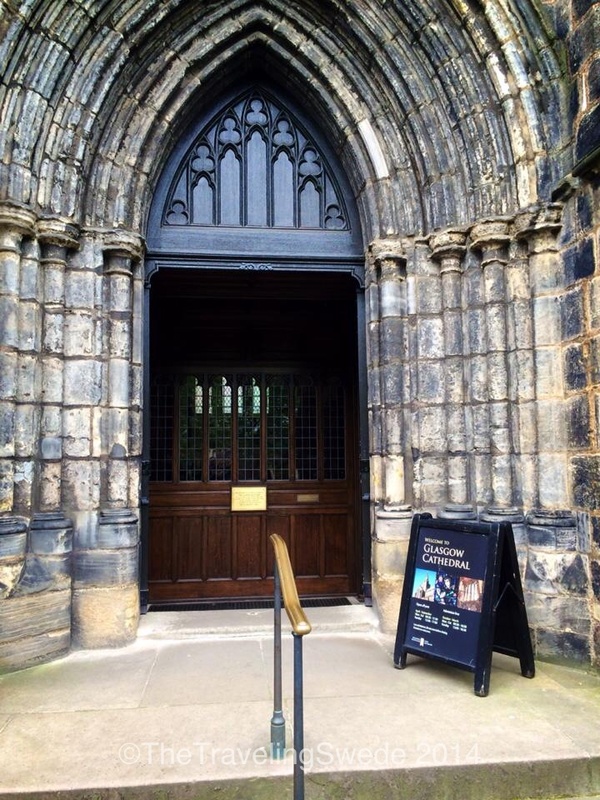 Almost 600 years of education has taken place here. Pretty neat when you think of it. 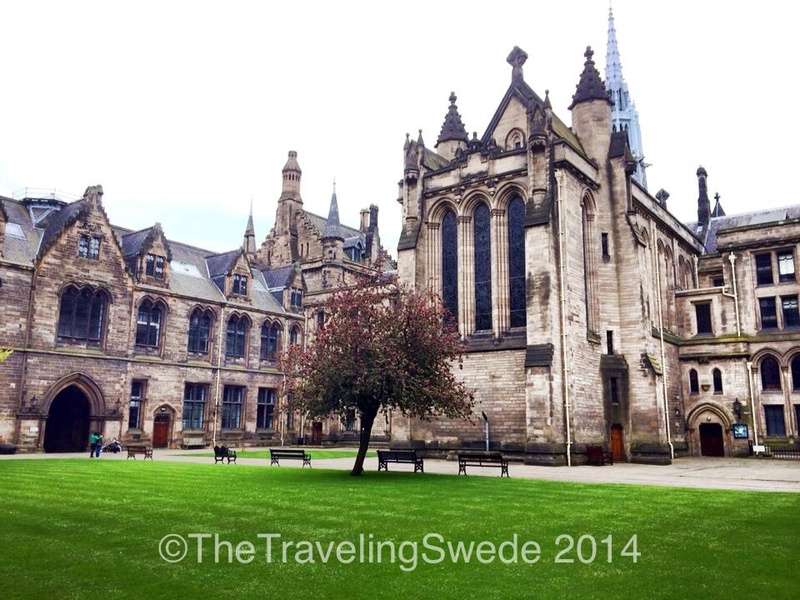 University of Glasgow is the fourth oldest English speaking university in the world. Many grand events has taken place here. Amazing architecture too. The university has three campuses now but we visited the main one. As we were leaving I had to take a last photo because well, I’m a sucker for these old buildings. 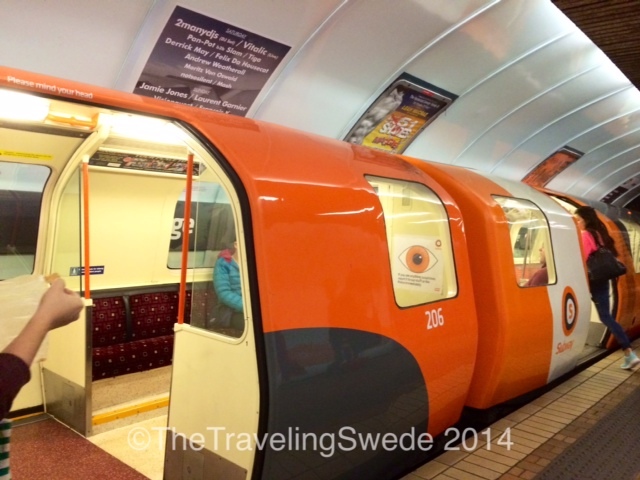 Glasgow subway. It’s tiny and cute. If you’re 6 ft tall you will have to duck to go through the doors. In case you want to spin in an oval circle all day you can. 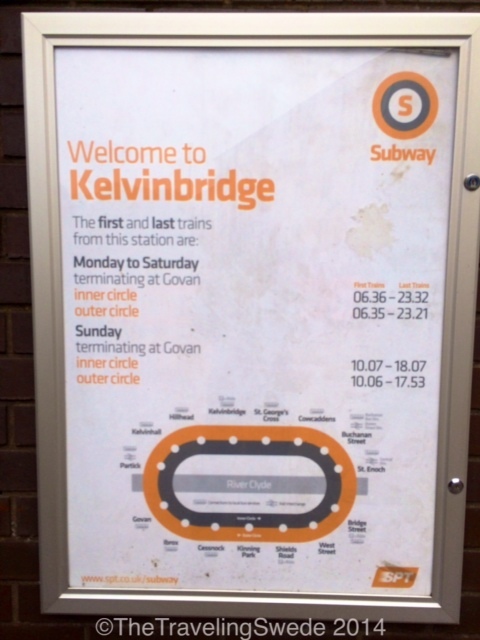 But only in Glasgow where the subway goes in circles. 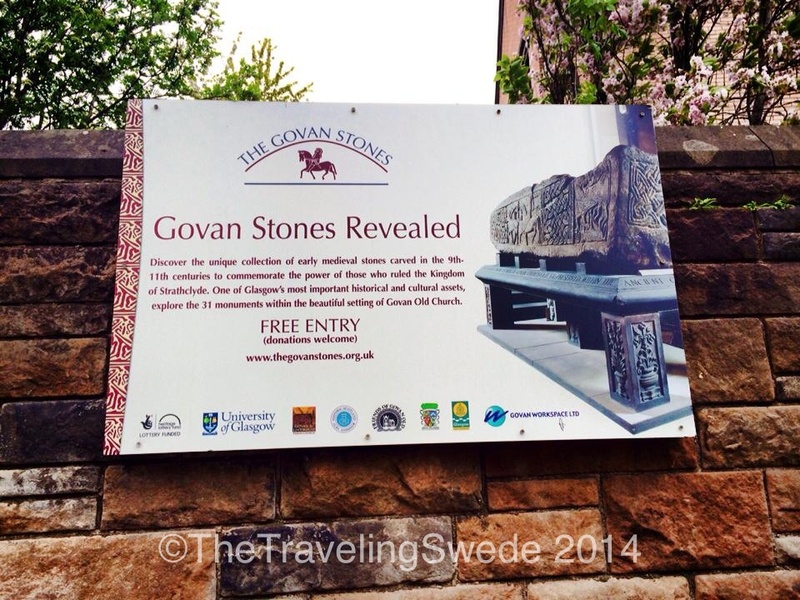 Just a short trip from the University lays the Govan Stones. Let’s go explore! 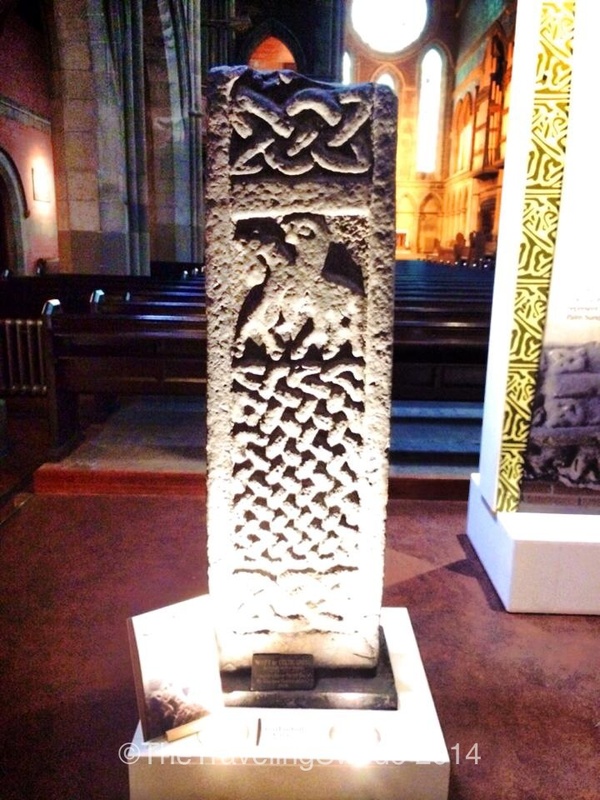 A medieval stone that is well preserved. There are signs of ceremonial activity in this area as early as the 5th century. 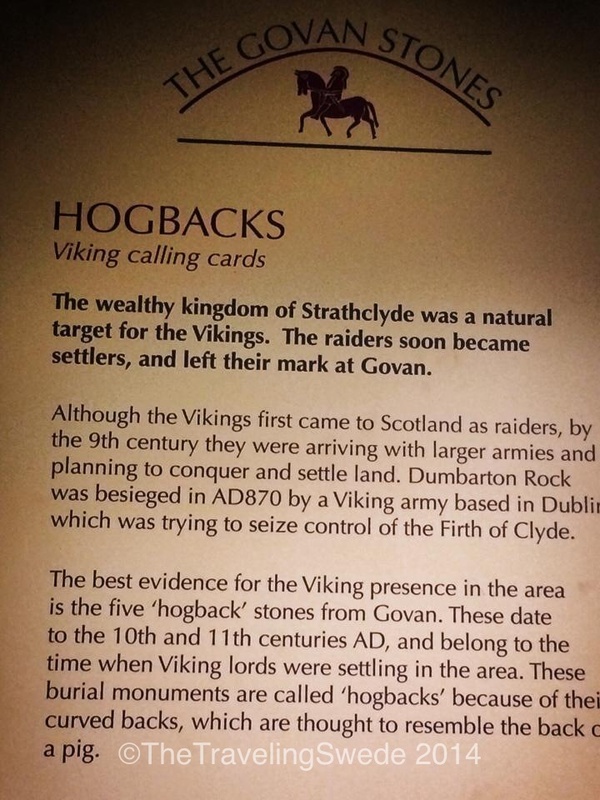 Hogbacks and what they are. 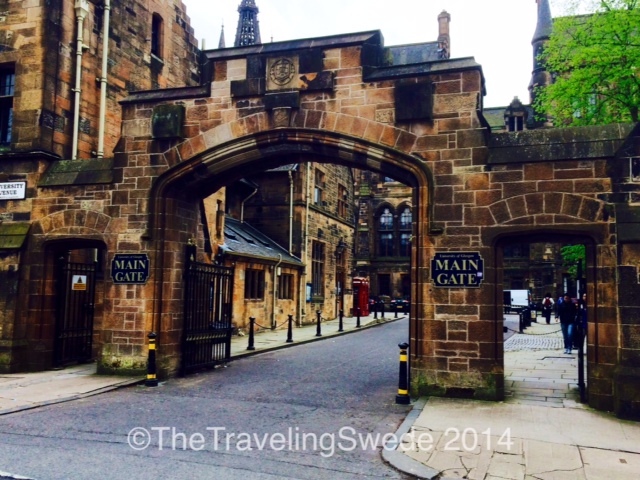 I wonder if I have any Viking lineage in me? Instead of doing their own gravestone old ones were “recycled” and used to engraved a new name. 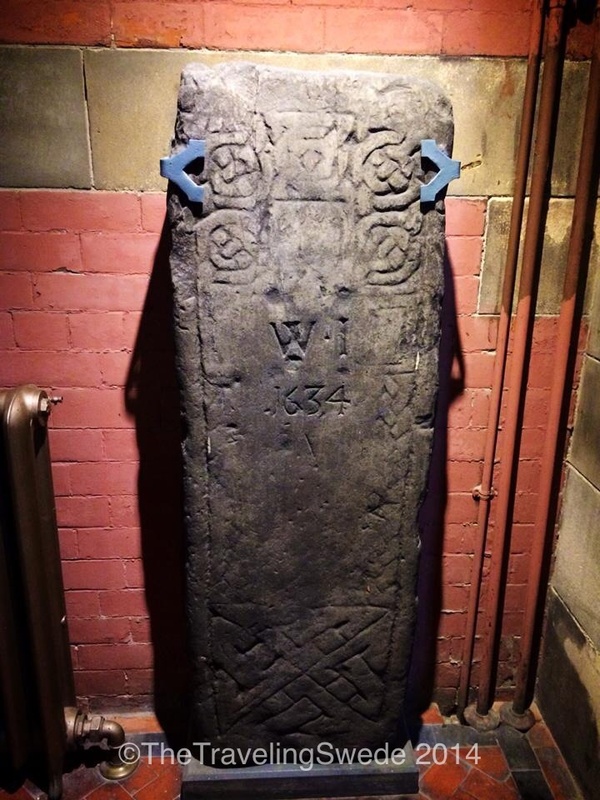 This one was engraved with the letters WI and year 1634 on a thousand year old medieval gravestone. 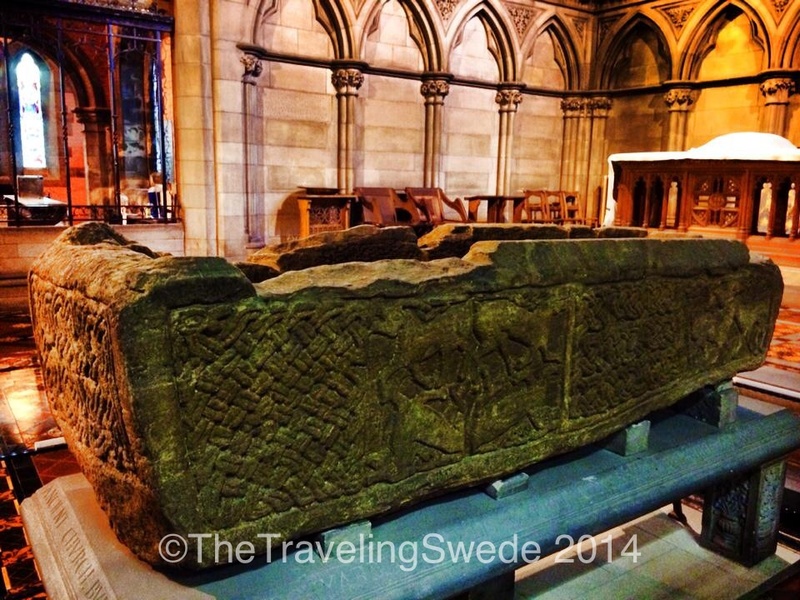 The Stone Coffin. This is an amazing piece of craftsmanship. 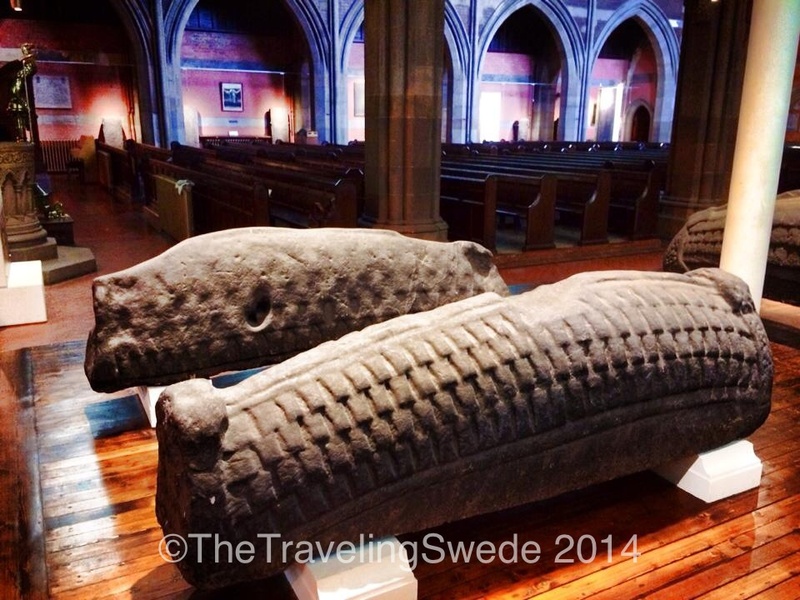 After an amazing walk at the University of Glasgow, a subway ride in what I now call the Hobbit subway because the subway cars are tiny and cute and a trip back to the Viking days it was time to go and explore more of the amazing history this city has. 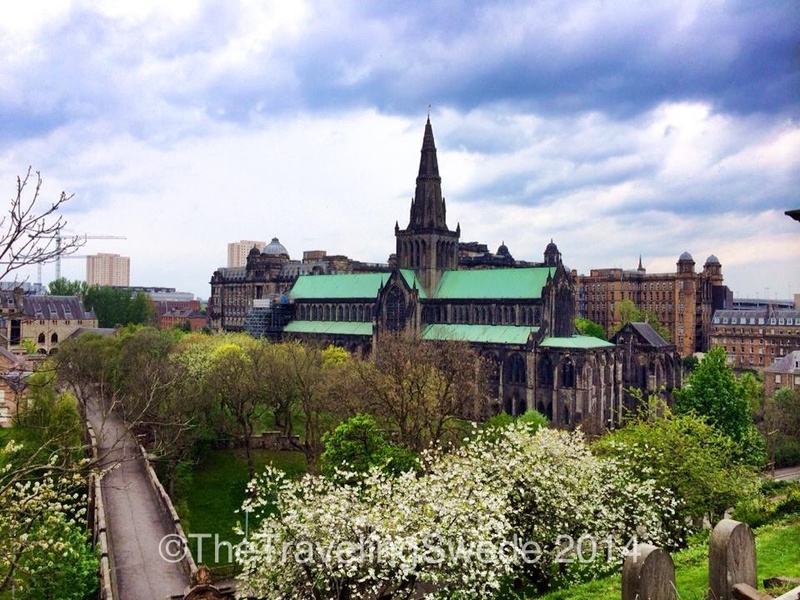 Namely Glasgow Cathedral and Glasgow Necropolis. I love cathedrals. 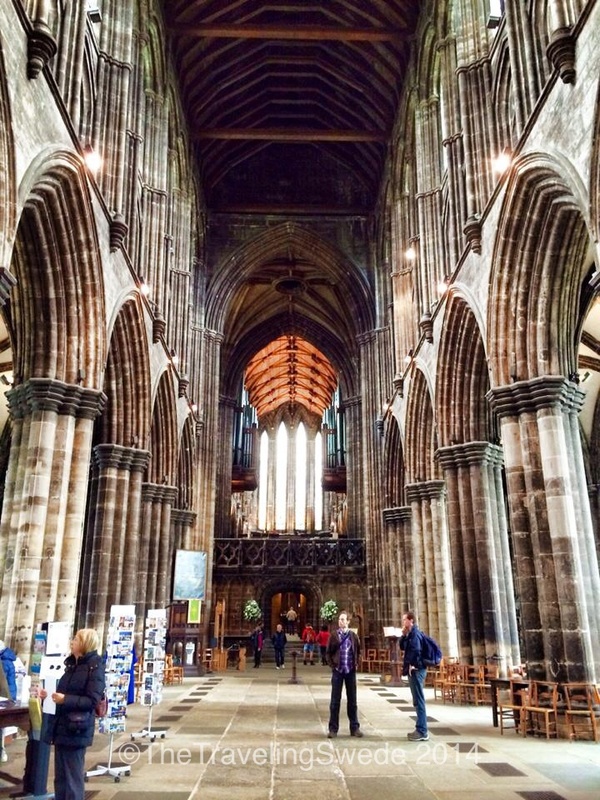 They are amazing pieces of architect and craftsmanship besides their quite extensive history. It was a little strange to walk inside and see stands with books, postcards and other material being sold. But look up, what an amazing piece of craftsmanship. 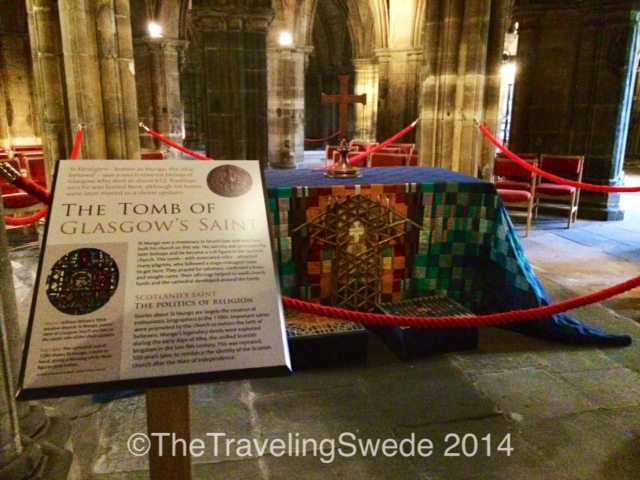 The first stone was laid 1136 and it took until 1197 to complete. The cathedral is still actively in service. This is part of why I love walking inside a cathedral. 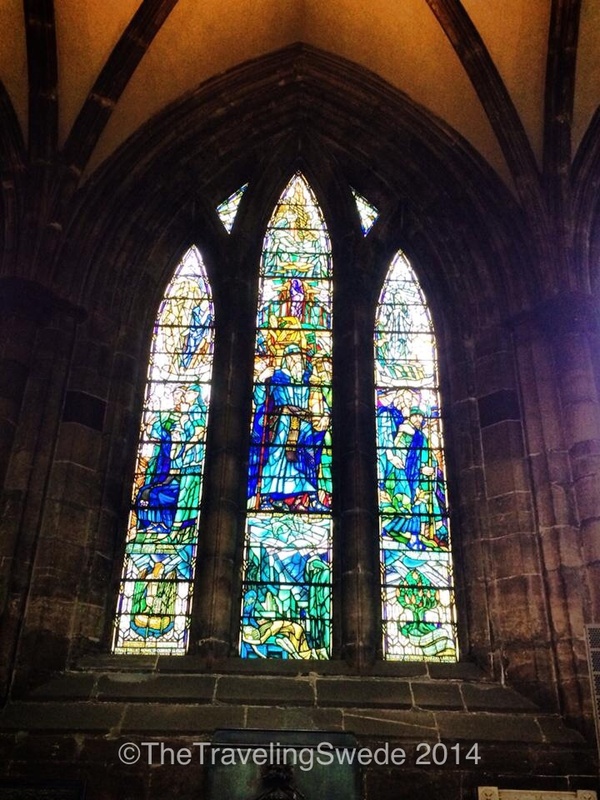 The beautiful glass that makes a window. As you’re walking inside and also in the basement you will see signs of people buried literally underneath your feet. But if you think it’s a bit eerie to walk on top of people buried in the 1600’s this was even more so. Buried here year 612…if rumor holds true. 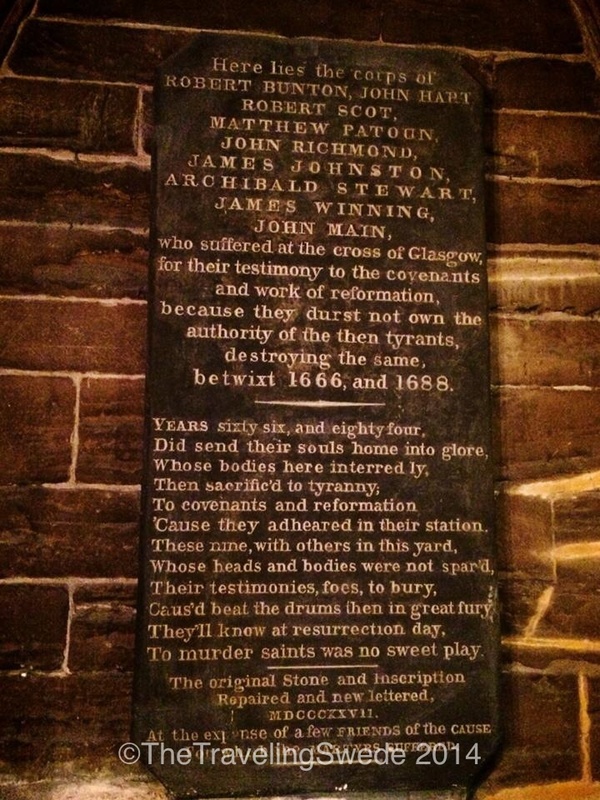 The basement at Glasgow Cathedral is both interesting and a bit eerie. If I’m going to walk among dead people I prefer to be outside. 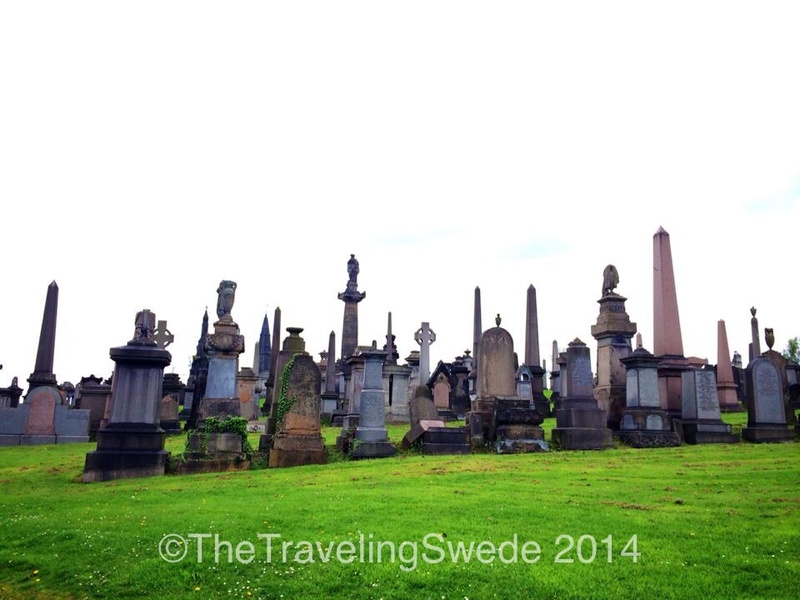 Glasgow Necropolis is one of the most significant cemeteries in Europe. It’s a short walk from the cathedral. 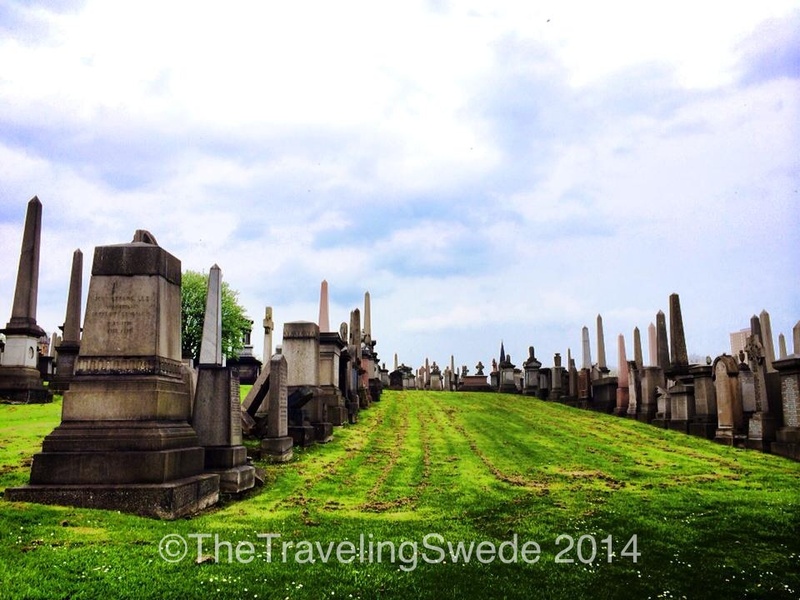 Over 50,000 people are buried here. 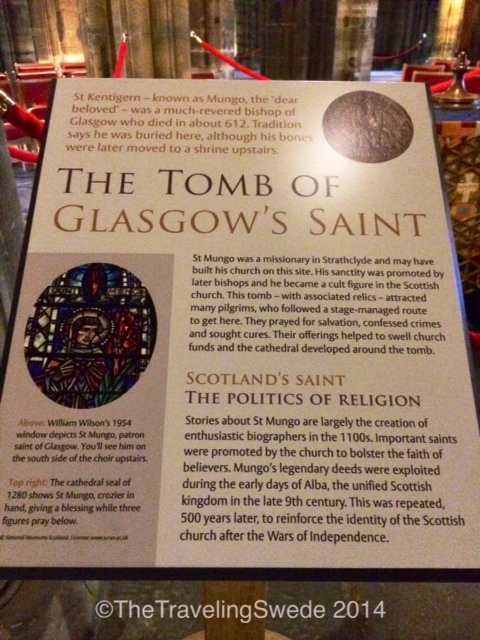 Many of them were prominent Glasgowians. Only about 3,500 monuments stand. I definitely would not want to walk here on a moonlit night. But during the day it’s peaceful. 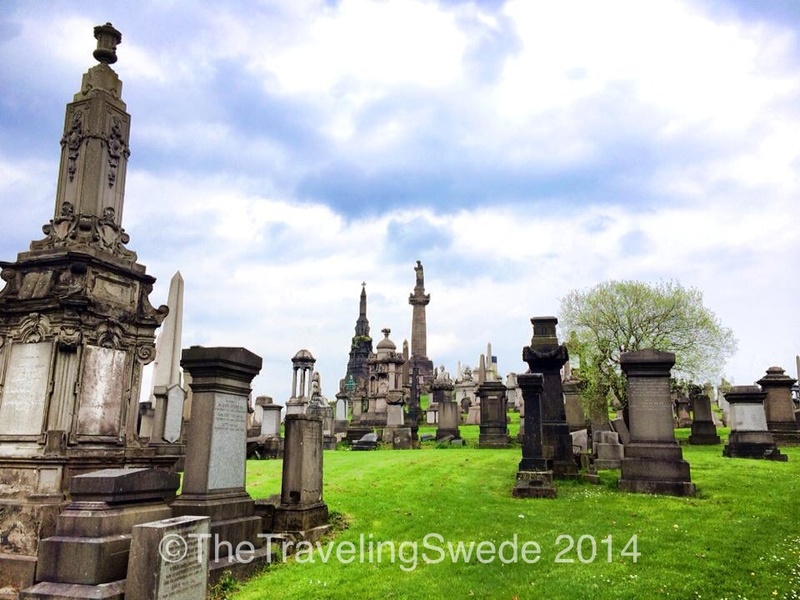 Many of these gravestones and monuments must have cost a fortune even back then. View of the cathedral from the necropolis. 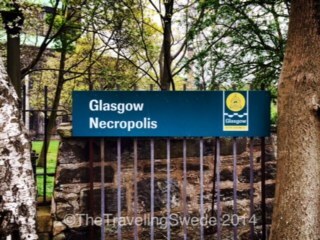 The Glasgow Necropolis wasn’t officially established until 1832. I never liked history in school but now when I travel I love it. I think it’s because I have a different appreciation for it because I get to experience it among so many different cultures. Or maybe it’s because this is how a true history lesson should be, out in the field. After a fun day of history it was time to wrap up my time in Glasgow. 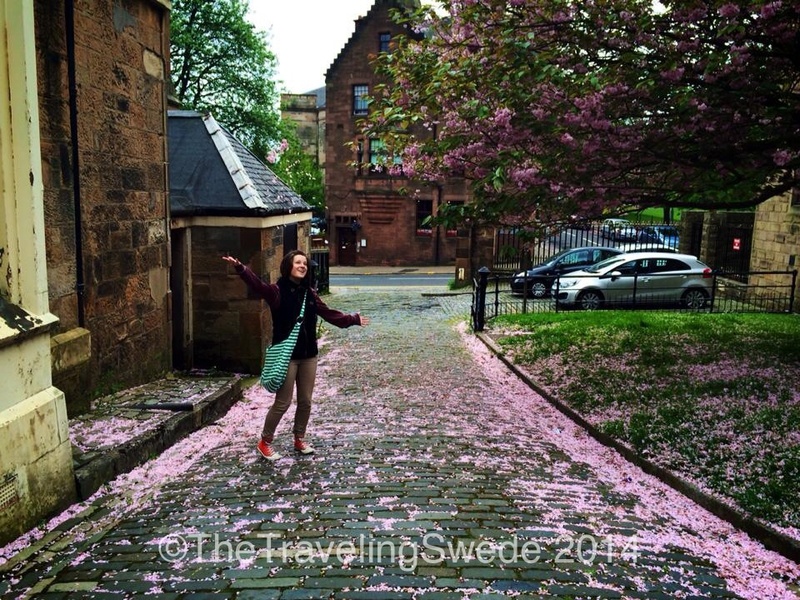 But not until we found one more cobblestone lined little street. I couldn’t think of a better way to end my short trip to Scotland. Next time I’m checking out the Highlands and northern part of Scotland but that’s for another trip. 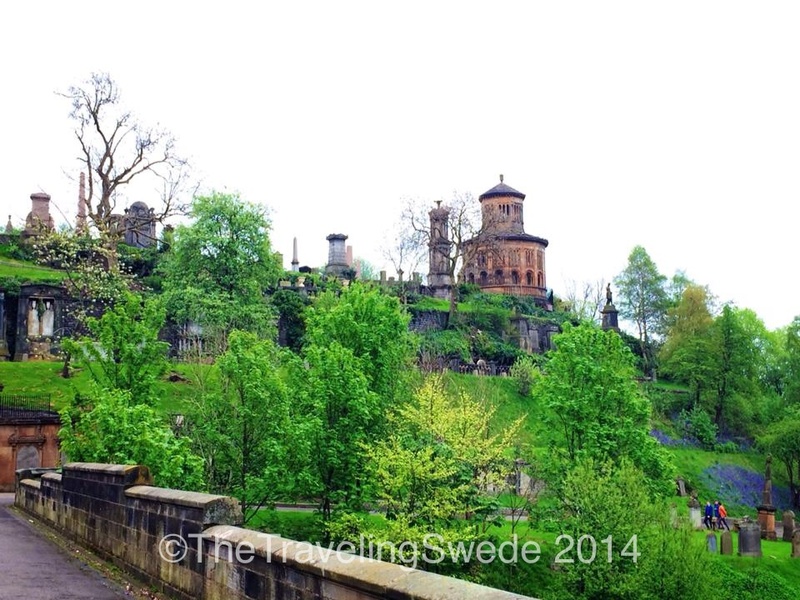 I still had some more exploring to do in Sweden.